Unfortunately we lost our 10½ year old German Shepherd dog, AKA name, Our Little Gretchen, just plain old Gretcheh or Gretch to us, yesterday. A very, very sad day when you lose such a loyal and loving animal that is more a part of the family than just a pet. Once in a lifetime you get 'The Perfect Dog', Gretchen was definately 'it' to us from day one until the very end. A gentle giant. Not once did I ever see her get aggressive or snap or bite even when I caught my three year old grand-daughter leading her around the house holding onto her tongue. Mal, first of all let me take the time to tell you how sorry I am for your loss. 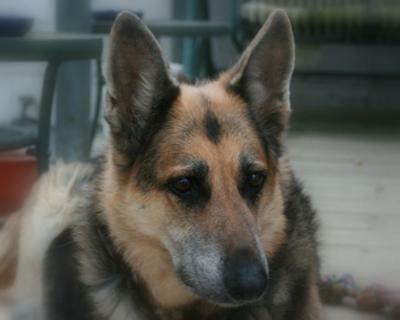 It is so very hard to lose a wonderful pet German Shepherd. But your memories of Gretchen will help you through your long grieving process. Hold them close. I found your story and I'm sorry for your loss. We are awaiting our arrival of our GSD on Wednesday. I felt compelled to write you a comment because we are naming her Gretchen! It's such a good name for a GSD. I hope my girl will live up to the name, and be a wonderful, loyal and sweet girl just like your Gretch! This is what my vet called Tristan, my 13 year old GSD I very reluctantly let go on Oct. 5, 2009 when his back legs could no longer support his body, a "gentle giant." I hope you find peace, and that the memories of your gentle giant sustain you as you grieve. It does get easier, although I doubt that it ever ends. I'm very sorry for your loss, she was a beautiful shepherd.I have one of my own and couldn't imagine what I'd do if I lost her,so again I'm very sorry for your loss and wish you the best of luck.